Dawn likes to get High. And no, I'm not talking about getting into the catnip. Dawn likes to be physically, logistically, location-wise High. As in looking down from above. I'm amazed at how, over time, she has managed to find ever more ways to be Up High. The look on her face when she looks down upon her minions--and, let's face it, when you share your life with a cat, you are a minion--is one of haughty superiority. She looks down upon you physically and metaphorically. When Athena sees a High Dawn, you can tell Athena wants to get High too. Athena looks up at Dawn, puzzled. She can't figure quite out how Dawn gets where she does. Sometimes, after she watches Dawn, Athena is able to figure out how Dawn did it, but most times she doesn't. Though I also get the impression that Athena simply chooses not to be as reckless as Dawn. Athena is a thinker, as opposed to Dawn's impulsive doer (and leaper) personality. Perhaps Athena is right in her careful consideration. Dawn's new favorite high place is a windowsill, where she has gotten stuck several times; Dawn gets up there easily enough but can have some serious issues getting down. Below are some of Dawn's favorite high places. And a few places Athena goes as well. Dawn's most favorite spot is at the top of the cat condo. The highest platform is officially hers. 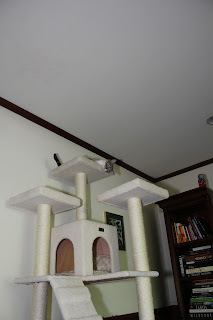 At first, Athena would climb the condo, and sometimes there were discussions about who owns which platform, but it soon became clear that Dawn ruled. Sometimes Athena would sleep on the next platform down, but I think Athena prefers the company of humans and humans don't hang out on the condo. Dawn on the top platform of the cat condo. Sometimes Dawn gets a little crazed when she's High. I've seen her chase her tail on the top platform--and even fall off. But she never knew I saw her...or there would have beeen Consequences. You are not to see a cat look foolish, and live to tell. Nobody gave you permission to be Higher than Dawn. Even a place as simple as stairs gives Dawn an opportunity to be High. She loves to stop on the stairs at a height that is taller than the human occupants of the house. In this picture, I think she's trying to swat the paparazzi (that would be me) away. Another favorite place for Dawn is on top of a shelf in the laundry room. Her favorite shelf is, of course, the tallest one, which is part of a drying rack that folds out from the wall. To get there, Dawn jumps onto the washing machine, then leaps onto the shelf above the paper towel holder, and then to the High spot. It's a little narrow, so she likes it best when the rack is pulled out, so she can turn around and get down. Resting on the paper towel holder. I think Dawn is about to start charging the humans a cat treat per sheet. From the paper towel holder to the drying rack shelf. It is just too cool to peak around the corner while on the shelf. Now Dawn is High and Sneaky. Dawn appreciates when the rack is expanded, to make it easier to turn around and get back down. Athena does not attempt any of the laundry room shelves, but she was happy enough to try out a ladder when Brian was changing a light bulb. 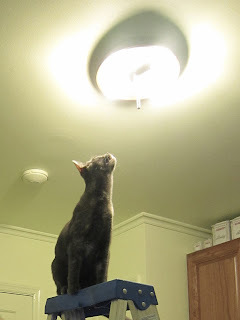 Athena thinks she can help fix the light. The most recent High discovery for Dawn is the half-moon windows in our living room. She jumps from the back of chair to the windowsill, then walks across the top of a tall bookcase and then saunters over to another windowsill. Queen of All She Surveys, Dawn perches on the tall windowsill. Note the bookcase in the background that she uses to get to the window. And pay attention to where Dawn's feet are: two on the windowsill and two on top of the blinds. There is no easy way to turn around. The problem with this High Place is it's ever so narrow, and almost impossible for Dawn to turn around and go back the way she came. She's been on the window three times now. Twice she managed--not too gracefully I might add--to turn around. The third time, she must have decided jumping forward was a better idea. So after she backed up, went forward, backed up, and went forward several times, she decided to make the big leap. That wasn't too graceful either. Though the resulting picture (how could I resist documenting this event?) made it look like Dawn was Spider Cat, simply walking down the wall. As I look around my home at other tall bookcases and dressers and buffets--and doors and cabinets and shelves, I am sure that Dawn is not finished with her exploring and experimenting with getting High. Stay tuned; I'm sure some time in the future, I'll have a follow-up post with yet more pictures of Her Highness. Thanks for the comment! I think cats are so cute, too. I think they're addictive; I understand why people have more than one. I'm sure your cats are happy as long as they have people who love them. Enjoy!